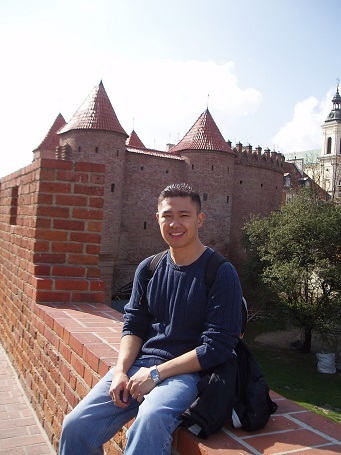 Our guest blogger Benjamin remembers what his first move to Europe taught him about culture shock. Wikipedia defines Culture Shock as “the personal disorientation felt when experiencing an unfamiliar way of life”. 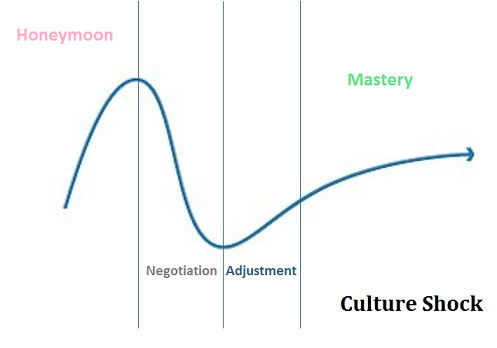 Culture shock can consist of four distinct phases: Honeymoon, Negotiation, Adjustment, and Mastery. Having lived in a few different places, I have experienced culture shock several times. When I travel to a new place, I don’t expect it to be the same as the place I just came from (that’s why I go in the first place), but often the differences catch me by surprise. In my previous post, I wrote about how traveling enables you to learn more about yourself. One thing I have clearly learned about myself is how I react to and handle culture shock. Looking back now, the best example of this happened when I first moved to from North America to Poland right after university for work. It sticks out in my mind, not because the culture shock was so severe; it’s because each phase was so clearly defined. The first phase is always the Honeymoon Phase. Mine began as soon as I arrived. I was filled with excitement and energy. I was curious about everything and even the simplest mundane task, such as going to the shop to buy bread, was exciting. I was eager to learn the language and meet as many people as possible. In the Honeymoon Phase, everything was great all the time, and my cultural learning expanded the fastest. My Honeymoon Phase usually lasts about two or three months, but it ends abruptly, and I then move into the Negotiation Phase very quickly when I encounter my first major crisis. I remember it was exactly 11 weeks into my relocation when the Negotiation Phase hit me like a brick wall. I got really sick. I always prided myself on being healthy and avoiding illness, but winters in northeast Europe come very fast and very strong. Being in the Honeymoon Phase, I was caught off guard. For the first time, I was scared. I was in a foreign country where I didn’t know the language, far away from my friends and family, didn’t know how to find a doctor or a hospital and couldn’t even explain what was wrong with me if I did. Next comes the Adjustment Phase or, as I like to call it, the Acceptance Phase. Fortunately, I had met some very nice people who helped me find a doctor and even accompanied me to the hospital. I was able to get the help and medication I needed to get well again, but more importantly, I realized that everything was going to be okay. I accepted my situation and my new environment. The Mastery Phase occurs about four months into the move. I remember this started around Christmas when my friends invited me to spend the Christmas/New Year’s holiday with them. It was my first Christmas away from my family and my home, but just like home, the holiday was spent with lots of food, fun and laughter. I came to realize that not everything was going to be great all the time, but that was okay because everything would work itself out. I figured out how things in my new location worked (more or less) and knew who I could turn to for help. Did I experience difficulties? Of course, but I knew how to deal with them, how to “master” them. I think culture shock is just something that all explorers have to experience each time they are on a new adventure. Everyone’s timetable will be different, and each experience may have a different timetable, but learning about more yourself is one of the most important aspects of expat life. Hello everyone. I find this article very helpful.We are moving to Georgia and my wife will be working as a teacher. We have 3 kids and will be staying in Tbilisi. This is our first overseas travel and we are from the Philippines. I’m glad to hear you find Ben’s contribution helpful. Good luck to you and your family for your move! If you come to Milan don’t esitate to keep in touch with me! @Shane Hayes You’re sooo right about: “once an expat, always an expat!” It has happened to me so many times. I have lived and worked in several countries, making sure though that I could speak the language, in my case Spanish and English. I made the United States my main base and even became a citizen of this country five years after my arrival. Then moved to Spain and had some five years of “Honeymoon” because I kept moving from one city to another and people were wonderful everywhere I went. I also spent some months in England and was funny that these British people had less problems with my English -w/ a strong Spanish accent- than the people I meet in different States in USA… but I have survived nicely. Now, I have tried to go back to Colombia to spend my last years of my life there and it has been very difficult for me. I have already tried it three times and after a couple of years I’m ready to come back to the States… and probably will die here. I find my family and friends there so out of touch with the world, at least the ones that have never left the country. Sometimes I get into conversations that last a little too long due to the fact that I have to explain all kinds of minutia that other expats understand very well. I feel that some of them feel sorry for me because I’m now alone in this world, after having a small family (my husband died and my daughter got married and stayed in Germany for good). I even asked myself sometimes “what would have happened if I never left my country and formed a huge family there as most of my cousins have done”? I see their photos in Facebook and I kind of feel jealous of seeing them already with their grown up children, and these are getting married and are having their own children, and soon they’ll have great-grandchildren! Frankly, I feel overwhelmed when I visit them because I have no idea of the names of the added family. It’s very uncomfortable to hear someone calling me: Hi Yolie, how are you? How long are you staying this time? I feel blushing because I don’t even know this person who’s calling me by my nickname and obviously knows me very well. 🙂 Thank goodness I’m a good actress and can talk back as if I just recognize him/her immediately and start the conversation…. which at the end becomes a monologous because I have so much to talk about and they don’t have much happening in their lives… except that their last baby is already walking, or the sister got married again, or the uncle moved to another city or small town. My honeymoon last about one month, mostly because I love the food I grew up with and I miss it when I’m abroad and same goes for the music…. but then comes the “little problems” that bother me and the culture shock starts hitting me hard. Then it’s time to come back to my “base country” and when it gets boring, I take off to another place to “breath new air” –as I call it. Right now I’m getting close to that move again, but this time I’d like to make it a little more difficult…. like moving to a country where I have to learn the language, like to Italy. I know the language a little bit because it’s very close to Spanish, but at my age it’ll be a challenge that I’m looking forwards to. So, wish me “bonna fortuna” and hope to meet lots of those happy people, who talk no only that beautiful language but they express themselves so well with their hands…. LOL…. I’ll need it. Ciao to everyone and hope to meet some of you in the Bella Italia! Just read this post and it seems like what I have been going through. Moving to China from Canada was a big difference and the honeymoon period lasted a few weeks and then died off. Having a slow and gradual descent to the negotiation phase ended yesterday when it felt like I had “hit the wall.” Feeling depressed, no energy and lonely with family and friends far away and everything about the language and culture being different. Seeing that people have gotten through it is good and that there is a nice “Mastery Phase” to look forward should help. What are some things that people have done to “break through” the wall? Thanks for commenting and sharing your experience! I hope you’ll son get over the culture shock and start feeling more at home in China. Thanks a lot for your great feedback! We’re happy to hear that you like the InterNations blog and our guest contributions. push carts trying to sell me something. Honeymoon should keep going though; i shot you for saying its brief! 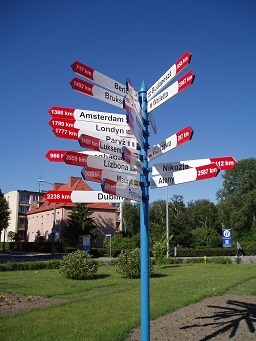 As the main thing of an “expat’ is the turbulent ever changing lifestyle. Aka your expat friends are temporary, all on short term contracts with foreign companies, brough in and shipped out, as such although it may not be your new time, its some other expat who has just arrived, time for more parties! I think you need a new one after Mastery; ‘REVERSE CULTURE SHOCK”; where you try to go back home country after many years, and you can’t fit in, the life just seems too weird, and normal. No longer are you a minority, but an average person amongst the crowd, your friends have all moved on, got married, had families, everything is different. All of a sudden you can’t reintegrate into your own culture (of which you were born). And within 6 months to a year you decide to pack up and move abroad overseas once more to be an expat, and this is where you will stay the rest of your life. I myself know many in this case; i myself after 4 years abroad tried move back home to Australia, but found it weird and too boring. I have once more moved oversea’s to China, and in Asia i will probably stay. Because once an expat, always an expat! Thank for sharing your experience here! You are completely right about “reverse culture shock”, of course. Repatriation and its related problems for former expats probably deserve more attention in general. How fascinating, to pick up and head to a country with very little familiar. And how thrilling. I traveled when I was young, and also when I joined the US Air Force. Since we moved frequently, and the AF did a lovely job of assimilating me, I was in the honeymoon period for quite a while. I am coming to a place where my travel bug is awakening and I’m ready to be off. Now where to? I love to explore and learn, not choosy about things so reading your blog is inspiring. I’m glad to hear that you find our guest author Ben’s perspective so inspiring. Hopefully, you’ll have an opportunity to set out and explore the world soon. I enjoyed reading peoples reactions to this recognizable situation. I have to admit I have gone though different kinds of vulnerablity in the health area…from giving birth to taking children to emergency rooms to finally being under the knife myself 1 year ago. All after living in the counrty for many years. BUT feeling slightly more unsure than I would in my own country simply due to interpretations, reading between the lines of what a doctor or nurse is saying in a situation you have no exprience of. This is something we can never really get a 100% grip on due to the second language factor. And this, my friends is the challenge. But, like you said Benjamin…it all works out. You just have to be unafraid to ask questions and even re-ask if you don´t quite get it. People take languages and understanding for granted when they are in their own countries. One often has to remind them and not be embarrased or annoyed…just simply ask for clarity. Thanks for your feedback and comments. I’m glad to hear that so many people read my post and found it helpful. Having relocated a few times, I have learned to recognize each of my phases very clearly. Of course, each person’s will be a little different, but it’s important to see and understand them. Getting ill in a foreign country can be a scary experience especially if you have a kid like myself. We moved to Munich/Bad Aibling and Alexis, my daughter, became ill a few times. Yikes!!! I grew up in Germany but lived in Las Vegas for 26 years. I wasn’t used to the German way of thinking anymore and Alexis, who was 7 at that time, had a huge culture shock. She still talks about that today. She is now 16. Your words have given me some insight into my situation. My ‘honeymoon’ phase lasted 2 days. On the third day of my stay in Athens I was mugged in mid day, on my way to the grocery store. I was attacked by two men who took my shopping bag with my wallet in it. I lost bank cards and money but I was lucky not to get hurt, juts few bruises. I’m sorry to hear that something like that happened to you. No wonder you must be feeling rather dreadful! I hope you’ll manage soon how to feel really safe again. My best wishes to you! thank you for your article. A friend suggested me to read it. I myself have gone through similar experiences, right now experiencing it again in Melbourne. After a while I understood there was a pattern in moving abroad to another place. And I decided too to write about it on my blog. My phases are similar to the Wikipedia’s ones that I didn’t know of before reading your article, although slightly different in lengths and concepts. It’s great to hear that Ben’s article inspired you. Thanks for letting him and our readers know about your “response”! Great article! I’ve only been in my current country a little over 3 weeks. So, still in the honeymoon stage. Unfortunately, I was very sick 2 weeks in. Yes, very scary to be so sick in a foreign land. Thankfully, I am surrounded by people who stepped in to help me. Dreading that “brick wall” of the next phase. But hopefully the anticipation will be worse than the phase. ;). Thanks for such a helpful article! I’m glad to hear you found Ben’s article so helpful. Hopefully, you have fully recovered from your illness by now. Thank you for reading my post. I am glad you found it helpful. I have slowly come to realize that getting sick in a new place is very normal. If you pride yourself on being healthy in your home country (as I did), you naturally think it will be the same in your new place. But your body is exposed to a new environment and new bacteria. Both our bodies and our emotions will need time to adjust to their new environment, but it’s all part of the adventure. Thank you for your post…I recently segued into my adjustment period here in Quito. Like you I also became ill (Am never sick) and the experience left me feeling helpless and alone. Even though I speak some Spanish and the Doctors spoke some English , it was still a wake up call to another level of adjustment in my new country.